This Spanbilt workshop shed is one of its kind as it is the only 4.5m wide workshop on the market with the luxury of a double and a single set of doors. 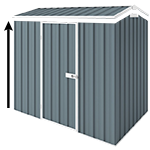 This colour YardPro ECO Plus 1510 Workshop shed is the ideal storage solution if you are looking for an affordable but strong steel workshop. Hi, if you buy the sliding window will the shed have the space for it already cut out so I wouldn't have to do it, thanks. Maria. Hi Maria, Thank you for inquiring us here. It normally depends on what model of the shed. -Yes, the shed will be pre cut if you'll get a window.